If you don’t know the medicinal capacities of Papaya leaf or popularly known as Pawpaw leaf, beyond being the leaf of a yellow fruit, then you are missing in action. It is strange that till today, many people who have papaya tree in their compounds don’t know how powerful the leaf is, as an alternative cure or treatment for many ailments. Save yourself of some hospital bills please and read this. ■ CANCER: Yes, Cancer, you heard me right.. If you are scared of cancer and you are looking for a natural shield to insure your health with, in a world full of many carcinogenic substances, then using papaya leaves will work well for you. There have been reports online and in some publications of people curing themselves from ‘incurable’ cancers with extracts made from papaya leaf. ■ DIABETES : Papaya leaf juice can work wonders for diabetics as well.. It regulates the production of insulin, which in turn checks blood sugar levels. Its strong antioxidant nature also helps to bring down the consequent complications of diabetes like kidney damage and fatty liver. There are proven scientific researches on this. So don’t miss this for your diabetic love ones. ■ HELPS TREAT SKIN PROBLEMS: Papaya leaf juice has a rich content of vitamin C and A, which boost skin health and give you a healthier and radiant skin. 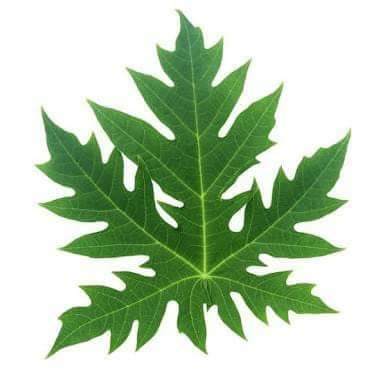 Papaya leaf juice suppresses the activity of free radicals. The presence of karpain compounds checks the growth of excess micro-organisms, and cleanses your skin of the toxins, providing protection against skin problems like pimples, freckles and acne. ■ ULCER: Papaya leaf tea protected against gastric ulcer in a study on laboratory animals published in the September 2008 issue of the “West Indian Medical Journal.” In the study, papaya leaf extract reduced ulcer severity and showed strong antioxidant effects. Papaya leaf extract also decreased oxidized lipids and increased antioxidant activity within red blood cells. Researchers concluded from this preliminary study that papaya leaf tea shows potential for the treatment of gastric ulcer and oxidative stress on the stomach. ■ MALARIA: Sure, you must be familiar with this as proven by several studies, that scientifically validated a combination of Carica papaya (paw-paw), Magnifera indica (mango),Vernonia amygdalina (bitter leaf), Psidum guajava (guava), Ocimum gratissimum (sweet basil), Cymbopogon citratus (lemon grass), Azadirachta indica (neem), seeds of Citrus aurantifolia (lime), Nauclea latifolia and Morinda lucida as potent cure that produce 100 per cent elimination of malaria parasites, even drug-resistant strains, in humans. So you see why drinking crushed pawpaw leaf is cool for your health? Lol. * Wash 7 medium sized papaya leaves. * Cut them up roughly and place them in a Saucepan with 2 liters of water. * Heat the leaves in the water until it boils and then reduce the heat right down to a mild simmer for 2 hours. By this time the liquid should be reduced by half. * Allow it to cool, remove the papaya leaves. * Drink 50 ml of the resulting concentrated papaya leaf tea three times a Day before Meal. STORAGE : This homemade papaya leaf tea can be kept in the fridge in a covered glass or ceramic container (not plastic) and should last for several days, though it was recommended to discard it if it became too cloudy. Total healing. Remember, health is wealth. Search Google for more facts, just as I did. You might have heard about put and call options? positioning this put up higher! Come on over and talk over with my web site .